Earlier this year I was lucky enough to have what was essentially a crash course in yoga at the Radiantly Alive studios in Ubud, Bali. Spending around 2 and a half hours a day contorting myself into seemingly unnatural positions and dripping sweat onto a mat (nice!) for a week was a total godsend after 5 months of lugging a backpack around; I felt infinitely more flexible, a bit stronger in the arm department, and completely clear headed. (Although how much of the last one is down to chilling in the sun with an ice cream most days is hard to tell). Now back in the real world I’ve been putting what I learnt into practice maybe two or three times a week. But since my niggling back woes have started to come back to haunt me, I’ve started hitting the mat as soon as I get home from work. 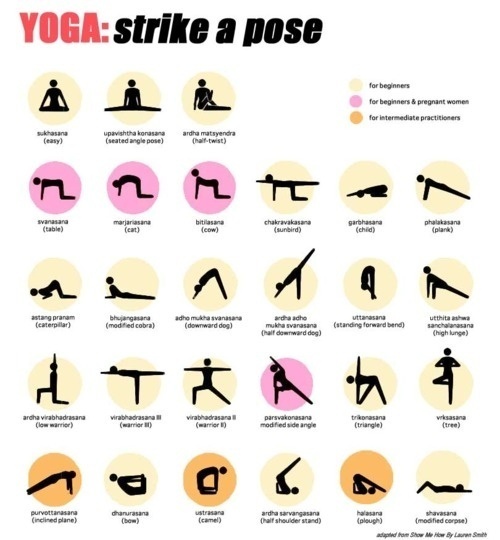 My routine is usually 5 rounds of sun salutation A followed by B a couple of times on each side (this worksheet is a great download to perfect your poses), and whatever I choose to do next I always include the pigeon pose . The first time I did this I thought I was going to die, my hips were so tight. This is a fantastic way to loosen them up, especially when held for a good 5 minutes, and I love the aligning effect it has on your whole body. So I need to hit the mat more often, and will be looking for good online workouts to share with you on here! Do you do yoga? What’s your routine?